Data Center Details pages put the most important information front and center: How interconnected is this data center? Is colocation space available? What other data centers are in this building? How many peers are available on the internet exchanges present at this data center? 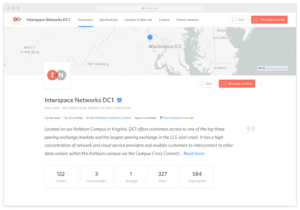 Effortlessly navigate between data center, building, network, exchange and provider pages, accessing powerful market intelligence at a glance. Have a question? Ready to get a quote from a provider? Inflect’s messaging tool lets you engage directly with providers in a low-pressure environment. Move from researching to interacting with providers with one click from any data center or provider page – no more contact forms to fill out or additional personal information required. Optionally share project details with the provider with ease, via the Project Details panel. 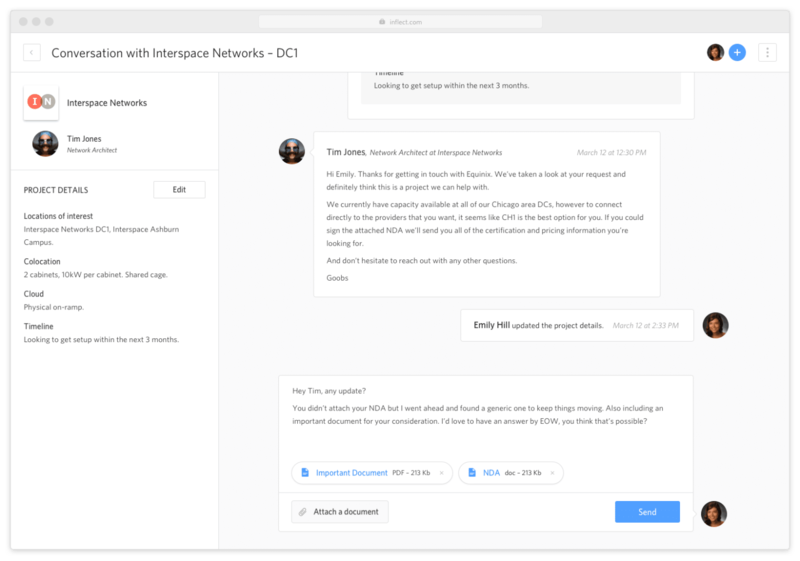 Provider conversations on Inflect allow your team to maintain a record of conversations and decisions, even as stakeholders come and go. Invite other teammates to conversations or easily retrieve provider contact information. 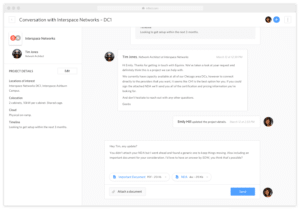 Reply directly to an email notification to update the conversation within the Inflect Global Marketplace messaging thread so that everyone stays on the same page. 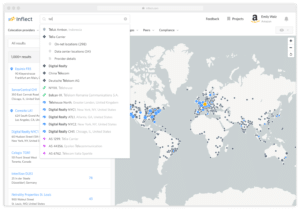 Search the Inflect graph database by geographic location, provider on-net locations, data centers, exchanges or Autonomous System Number (ASN). 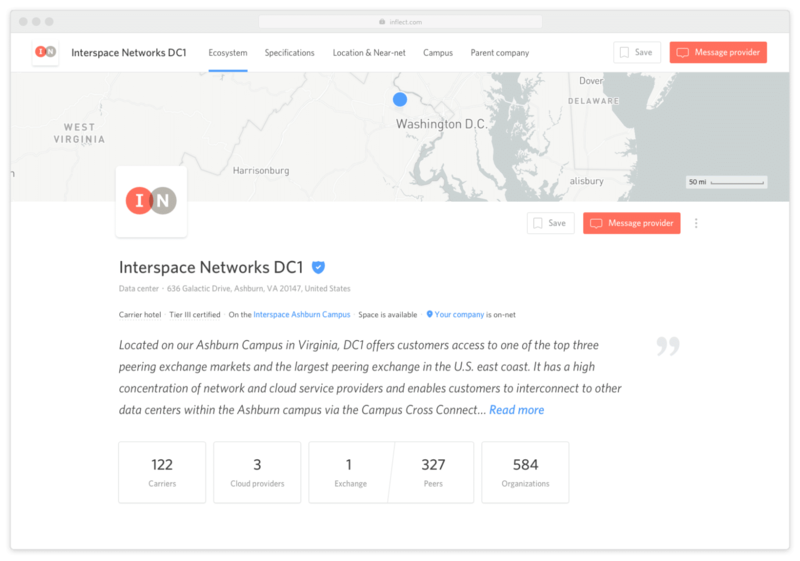 Inflect’s autocomplete experience accurately matches the search query with known content as you type, making it easy to find provider on-net locations, data centers, and more. The digital infrastructure industry has long been in need of a neutral source for market data. 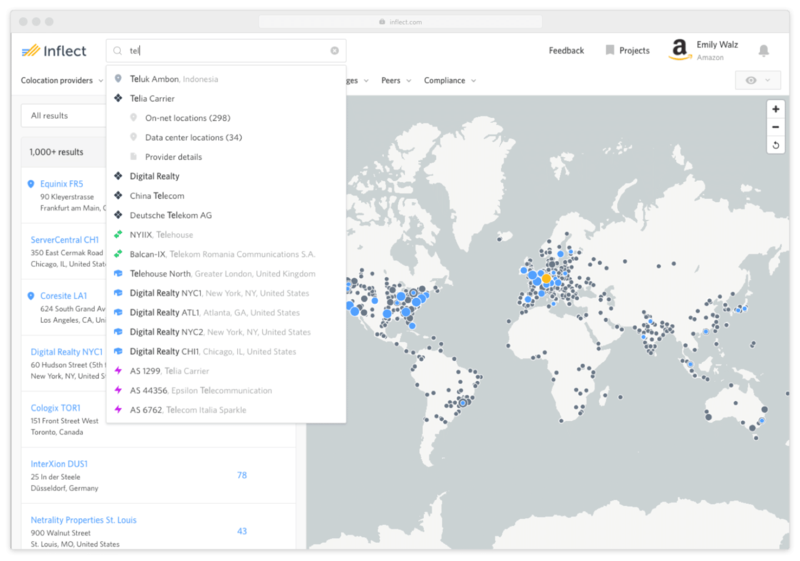 With its powerful, proprietary database and modern visual user interface, our Global Marketplace makes it easier than ever for you to make informed decisions regarding global data center and network services. At Inflect, we’re doing more than building a powerful, neutral marketplace: we’re unlocking the pace of innovation by removing the constraints of internet infrastructure. This is only the beginning. Start building your next infrastructure project on Inflect! Visit www.inflect.com to get started. Are you a service provider and want to learn more about partnering with Inflect? Send us a note at hello@inflect.com to learn more about our provider partnership process and how to get your assets into the marketplace and in front of Inflect users around the world!